Nothing can stop Trump from launching a nuclear weapon. 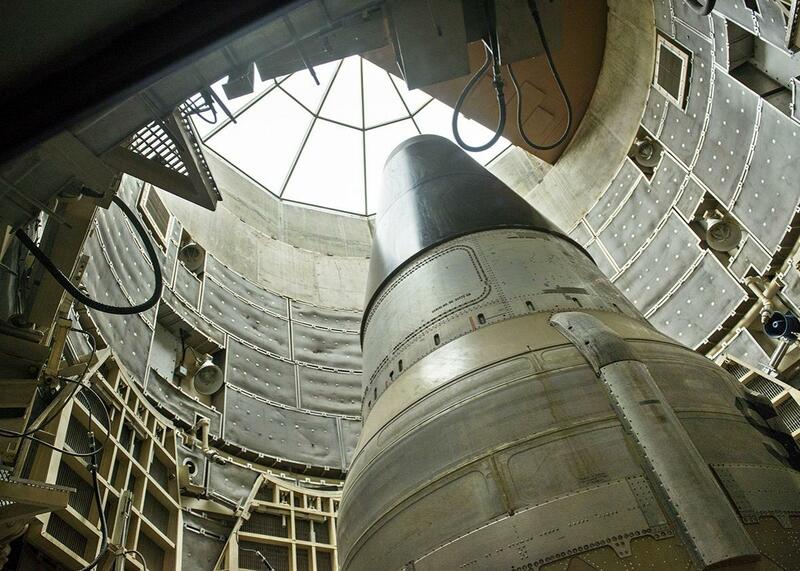 A deactivated Titan II nuclear ICBM is seen in a silo at the Titan Missile Museum on May 12, 2015, in Green Valley, Arizona. Tuesday morning, Congress held its first hearing in four decades on the president’s authority to launch nuclear weapons, and the results were fascinating, frightening, and ultimately maddening. Fascinating because not since the Cold War has any public figure wrestled with the strategic and moral issues of a nuclear first strike or the legal question of resisting a presidential order. Frightening because the presence of an unstable, insecure, brimstone-fueled president is what’s reviving this discussion. Maddening because it was clear, by the end of the two-hour hearing, that Congress isn’t going to do a damn thing about the dangers. The hearing, conducted by the Senate Foreign Relations Committee, got to the point early on when one of the witnesses, retired Air Force Gen. C. Robert Kehler, former commander of U.S. Strategic Command, said in a stab at reassurance, “The U.S. military doesn’t blindly follow orders,” that in fact members of the armed forces are not obligated to obey illegal orders. This prompted the ranking Democrat, Sen. Ben Cardin of Maryland, to ask how the president might be legally constrained from launching a nuclear first strike. If military lawyers advised the president that a strike he wanted to launch was illegal, could he simply ignore their advice? Which, of course, is the cause for worry in the age of Donald Trump. Which didn’t inspire an assuring image, either. The fact is—and it was a fact that witnesses evaded for most of the hearing—the president of the United States has no legal obligation to heed any adviser on this score. He can launch a nuclear attack at will. And much as the four-star general in charge of Stratcom or the civilian secretary of defense might muster opposing arguments, they are not even in the nuclear chain of command. The order goes from the president to a one-star general at the National Military Command Center, and straight from there to the officers manning the ICBM silos and the nuclear submarines who would turn the keys and launch their missiles. As Kehler said, there is a protocol for the president to consult with secretaries and commanders, but there is no requirement for him to do so. Even if there were a requirement, it might not matter. Bruce Blair—a former Air Force launch officer who is also a resident scholar at Princeton and the co-founder of Global Zero, an organization advocating the elimination of nuclear weapons—told me that he’s talked with Stratcom lawyers and that they’ve devised legal rationales to justify almost any sort of nuclear attack that a president might want to order. Kehler came close to admitting this as well. As long as the president chose to execute one of the nuclear options that Stratcom had already placed in its book of war plans, he said, then there probably wouldn’t be a legal problem. The fact that these are official Stratcom options means that the lawyers have already resolved all their questions. Still, Kehler said there was room for Congress to provide guidance to the military. For instance, he said, the president—“in my view”—would lack the legal authority to launch a preventive first strike without congressional approval. Brian McKeon, a Pentagon official during Barack Obama’s administration, agreed, saying that in the absence of an imminent attack, the Constitution requires the president to consult with Congress before launching an attack. On the other hand, Feaver wondered if this was the case. The United States, after all, is still in a state of armed hostilities with North Korea. The armistice that ended the Korean War in 1953 is, formally, a mere ceasefire. That fact, he said, might provide “some legal basis” for presidential action, though he added that he wasn’t a lawyer and couldn’t say for sure. The committee’s chairman, Sen. Bob Corker of Tennessee, replied, “I think that’s correct,” then added, “that’s the purpose of the hearing.” In other words, Corker seemed to be saying yes, the president has sole and exclusive power to launch nuclear weapons—so is there anything we should do about this? At that point, Massachusetts Sen. Edward Markey, a Democrat, made a pitch for a bill he’s introduced requiring Congress to pass a declaration of war before a president can launch a nuclear first strike. Markey emphasized that he wasn’t talking about a situation in which an enemy power has launched a nuclear strike against the United States. Under that scenario, most would agree, decisions must be made quickly, and only the president, under Article 2 of the Constitution, has the power or ability to make those decisions. But a pre-emptive or preventive nuclear strike is another matter. The distinction is not only crucial but relevant, Markey noted, because Lt. Gen. H.R. McMaster, Trump’s national security adviser, has publicly said a preventive nuclear attack—prompted not by a North Korean attack but simply by its acquisition or testing of an ICBM with the range to hit the United States—is an option on the table. And with that, Corker brought the hearing to an extremely inconclusive close for who knows how many more years.